Aruba is one happy place to be -- year round. The typical Caribbean vacation used to mean a quick flight south and then hours of sunning on the sand. However, todays vacationers are looking for more than just a day at the beach. Many Caribbean islands now offer an array of outdoors activities and Aruba--referred to as One Happy Island--definitely is one of the top spots for mild to wild activities on land and in the water. The island's gentle breezes, endless sun and a year-long warm temperature make it a destination any time of the year. Situated just 15 miles north of Venezuela and a 2 1/2-hour flight from Miami, Aruba is a natural when it comes to outdoors fun in the sun. The island, 20 miles long by six miles wide, is ideal for convenient exploration off the beaten path, while the semi-arid topography and geological formations offer a wealth of activities distinct from other Caribbean isles. 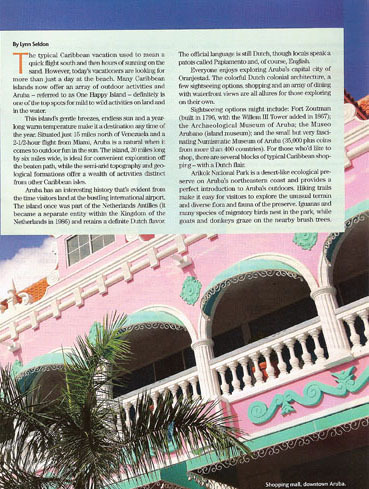 Aruba has an interesting history thats evident from the time visitors land at the bustling international airport. The island was once part of the Netherlands Antilles (it became a separate entity within the Kingdom of the Netherlands in 1986) and retains a definite Dutch flavor. The official language is still Dutch, though locals speak a patois called Papiamento and, of course, English. Everyone enjoys exploring Arubas capital city of Oranjestad. The colorful Dutch colonial architecture, a few sightseeing options, shopping, and an array of dining with waterfront views are all allures for those exploring on their own. Sightseeing options might include: Fort Zoutman (built in 1796, with the Willem III Tower added in 1867); the Archaeological Museum of Aruba; the Museo Arubano (island museum); and the small but very fascinating Numismatic Museum of Aruba (35,000 plus coins from more than 400 countries). 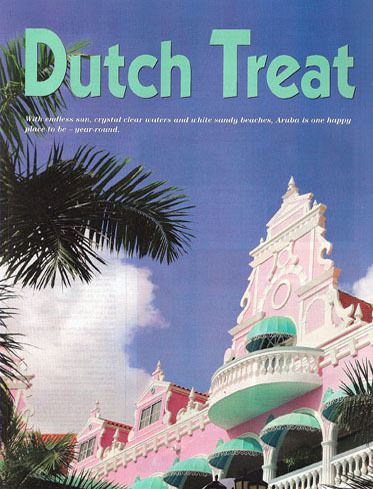 For those whod like to shop til they drop, there are several blocks of typical Caribbean shopping--with a Dutch flair. Arikok National Park is a desert-like ecological preserve on Aruba's northeastern coast and provides a perfect introduction to Aruba's outdoors. Hiking trails make it easy for visitors to explore the unusual terrain and diverse flora and fauna of the preserve. Iguanas and many species of migratory birds nest in the park, while goats and donkeys graze on the nearby brush trees. Visitors feeling particularly plunky can try dune sliding with the locals at the nearby Boca Prins dunes. Most visitors to a tropical island don't expect to find underground caves, but amateur spelunkers will love the caves of Aruba. At the Guadirikiri cave, sunlight filters though two inner chambers, providing the perfect photo opportunity for intrepid cave explorers. The cave's 100-foot-long tunnel is home to hundreds of harmless bats. Nearby, the Fontein cave is testimony to the island's native population. Still-visible drawings by the Arawak Indians decorate the caves ceilings and are a powerful reminder of the island's indigenous history. Couples aren't the only ones who will want to visit the Tunnel of Love, named for its heart-shaped entrance. The 300-foot tunnel winds through several fascinating rock formations and narrow passages. Constant breezes make Aruba one of the best windsurfing sites in the world. Some of the more popular windsurfing areas lie along Arashi, Hadikurari, and Palm Beach. Rentals, lessons, and many windsurfing packages are available. Some of the world's most fascinating wrecks lie just off Aruba's shores, offering some of the best wreck diving in the Caribbean. Measuring 400 feet, the Antilla Wreck is one of the largest wrecks for scuba divers in the Caribbean. This German freighter sunk in 1945 and now has lots of lobster and giant tube sponges, making it a particularly popular night dive. In addition, the Pedernales Wreck and many other wrecks and reefs make Aruba one of the new hotspots with scuba divers and snorkelers. Island tours on a bus or on your own provide a perfect initial overview of a Caribbean destination. Off-road Jeep tours are very popular. With most, participants either take their own vehicle convoy-style (communicating with the guide by radio fitted on each vehicle) or just enjoy the ride in a larger four-wheel-drive vehicle driven by a lead guide. Either way, its a great way to see all the island has to offer--and it most definitely feels like a safari in parts of Arubas desert-like natural areas. After zipping past the hotels along Arubas famed beaches (Palm Beach is a Caribbean classic), the first stop is often the landmark California Lighthouse, named for a passenger ship that sunk nearby in 1916. Located on the northwestern end of the island, there are great views out to sea, including crashing waves--as well as a sneak peak of the arid and cactus-packed Arikok National Park that lies further ahead. After the lighthouse, the tour leaves the smooth hard-surface highway and heads off-road onto dirt-packed trails, with the lunar-like landscape and barren coastline a complete change from the resorts along Palm Beach. The drive from here on out can be dusty, so passengers typically are covered in red dust. About five miles along the coast, most tours stop at Alto Vista Chapel, a quiet off-yellow chapel that was built around 1750 and was renovated in the mid-1900s. Like many places of worship, the small church was built to take advantage of the stunning views out to sea. Next, the ruins of the Bushiribana Gold Mine make for a hulking reminder of Arubas gold rush in the 19th century. This smelter was built in 1872 and its easy to climb the huge stone walls for more coastal views. Further along, what was once Arubas main non-beach attraction still draws lots of visitors. The Natural Bridge was a 100-foot limestone arch that stretched across the beach and rock-strewn waters. It collapsed in 2005, but it still draws hundreds of visitors daily. From here, tours typically head inland a bit to check out the quite unique Ayo rock formations. These huge boulder served as dwellings and religious sites for early islanders--or at least what the guides and petroglyphs apparently tell visitors. Quite simply, Aruba has some of the best beaches in the Caribbean. Depending on your sun and sand desires, there's a beach in Aruba that will meet them. All of the beaches are public, making Aruba a beach-lovers paradise. The best and most popular beaches are situated along the western and southern shores of Aruba. The area is known as the Turquoise Coast for good reason, as the color of the sea is definitely the bluest of blues. Palm Beach is one of the most famous beaches in the Caribbean. Though it is packed with busy resorts (they picked the best beach), it is still great for sunning, strolls in the sand, and cooling swims in clear waters. Closer to Oranjestad, the capital city, Eagle Beach is another popular choice. It's generally less-crowded than Palm Beach and ideal for a quick dip.